SST overview map & stats from my 2011 hike. The Southeastern Serpentine Trail (SST) is an almost 600 mile trek through the southern part of the Appalachian mountains. It passes through four states and consists of a combination of the Foothills, Bartram and Benton Mackaye trails, along with the Smokies section of the Appalachian Trail (AT). 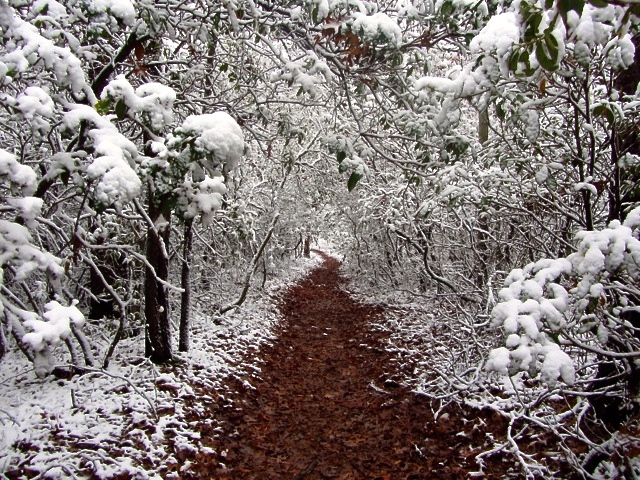 The SST was the sixth thru-hike in the 12 Long Walks series of 2011/12. My primary goal in piecing it together was to experience parts of the southern Appalachians that weren’t as frequented or well trodden as the busy AT corridor. I found the solitude that I was looking for and much more besides. All logistical details have been updated as of April, 2018. Classic trail markers on the Georgia section of the Bartram Trail. Distance: 583 miles (938 km) approx. Start: Table Rock State Park, South Carolina. Possible all year round, though spring and autumn are ideal. Personally I’d suggest hiking in September/October – less crowds, cooler temps and the opportunity to catch the Fall foliage. I hiked the SST during a very cold and wet and November. Temps in the mid-30’s to low 40’s F, combined with rain on eighteen of the twenty-four days. If you choose to follow in my footsteps and hike at the same time of year, I highly recommend bringing an umbrella and an ironic sense of humour. Final day on the Southeastern Serpentine Trail | November, 2011. 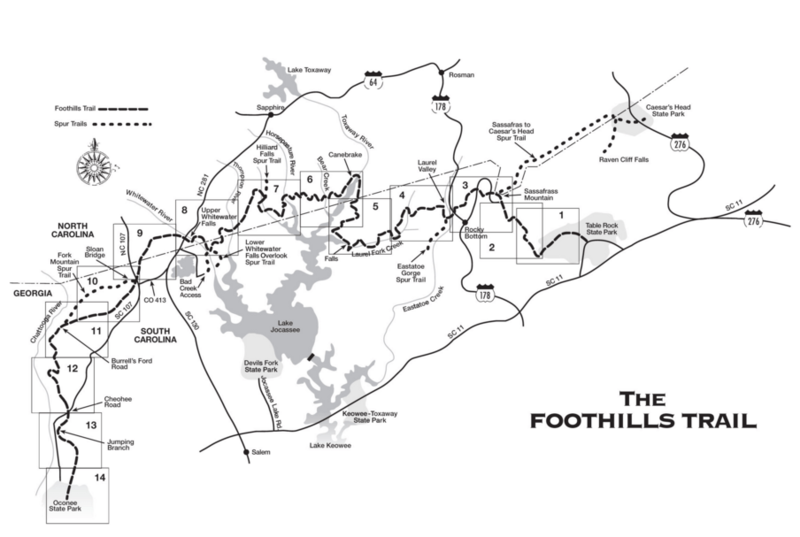 Foothills Trail (FT) – 68 miles (109 km) / Plus an extra 4.8 miles connecting the FT and BT (see details below). 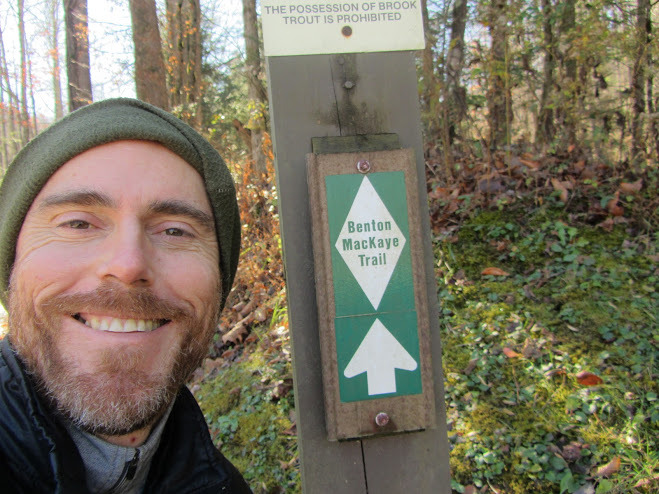 I left the Foothills Trail at Lick Log creek (about 8 miles shy of its official terminus) and took the 4.8 mile connector (Chattooga Trail) to Russell Bridge and the beginning of the Bartram Trail. I hiked the entire 116 miles of the Bartram Trail, finishing at Cheoah Bald, NC, where I joined up with the Appalachian Trail. Junction of the Bartram and Appalachian Trail sections. From Cheoah, I headed northbound on the AT for 92 miles, finishing this section at Davenport Gap. For resupply purposes, I continued on another 3 miles to Green Corner Rd., TN, which is the turnoff to Standing Bear Farm. From Green Corner Rd. I headed back to Davenport Gap, which is the starting point for the final and longest section of the SST, the Benton Mackaye Trail. Beginning the final section of the SST near Davenport Gap. The Foothills Trail is a scenically impressive 76 mile pathway that winds its way through the gorges, mountains and forests of South and North Carolina. Online Information: Foothillstrail.org is an excellent resource for anything and everything pertaining to the trail. Through the website’s store you can purchase a trail map, guidebook and pocket elevation profile. A one-stop-shop for all of your FT planning needs. Click here for GPS coordinates for the FT.
Fall colours: I hiked the Foothills Trail in early November, 2011. Around the lower elevations of Table Rock state park, autumnal colours were still in full swing. Gorgeous. Lots of Water: During its course, the FT passes along creeks, lakes and rivers. 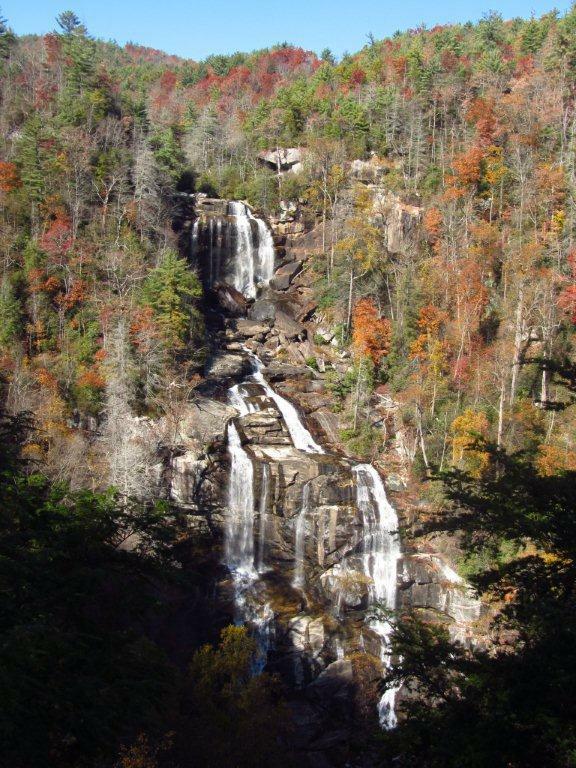 Particularly impressive from a H2O perspective are the waterfalls; the most spectacular of which is the multi-tiered Lower Whitewater Falls (see photo below). 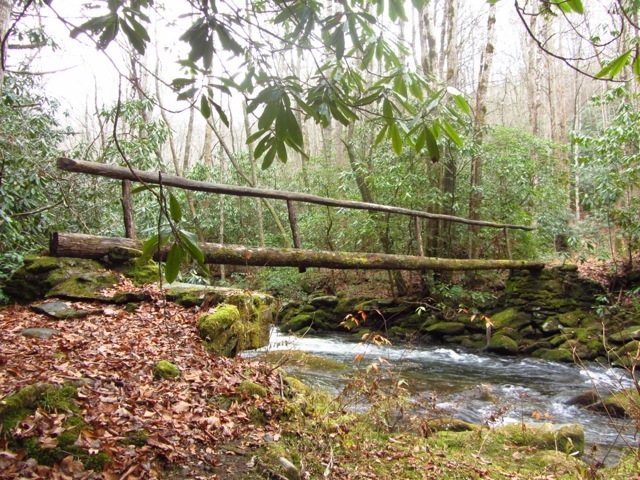 “Deliverance”: The Foothills Trail parallels the Chattooga River for a short section. Besides being one of the premier trout fishing locations in the US, the Chattooga is famous/infamous for being the setting of the the movie Deliverance. I am happy to report that I did not spot a single toothless hillbilly during my time in the area. Indeed, the only people I encountered were well-spoken fisherman and a group of boy scouts, who upon discovering I was from Australia, bombarded me with questions about snakes, sharks and the Crocodile Hunter. 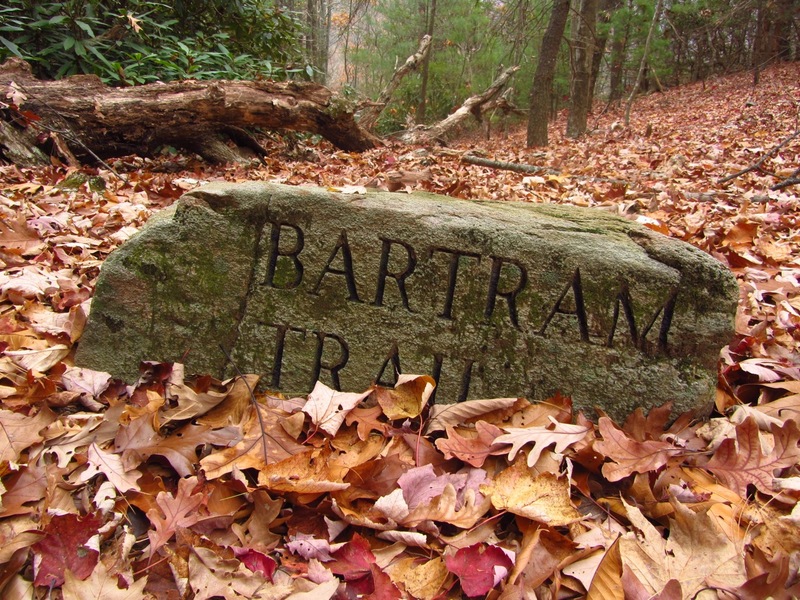 The Bartram Trail consists of two sections – Georgia (38 miles) and North Carolina (78 miles). Each state has it’s own separate website, maps, guidebook and even trail markers. Indeed, as of July, 2016, there doesn’t seem to be a single trail map that covers the entire pathway. Strange. Guide Books: There are two; one for GA and one for NC. They come in the form of 8.5×11 spiral bound booklets. Both include detailed mileage points, trekking notes and maps. More than sufficient for navigation purposes on this easy to follow footpath. You can purchase both guides at either of the following websites: Georgia Bartram Trail Group or North Carolina Bartram Trail Society. Caltopo Maps: Free downloadable USGS 7.5 topographic maps for the Bartram Trail. Online Info: The excellent Bartram Trail page at Trailquest.net has logistical details, mileage points & detailed trekking notes for the entire trail. Good place to start your BT planning process. No.1 for Solitude: The Bartram Trail was voted by readers of Backpacker Magazine to be the No.1 U.S. long distance trail for solitude. Sure enough, when I hiked the BT in 2011 I didn’t encounter a single other hiker. However, the lack of on-trail traffic left me puzzled. If the Bartram Trail really was selected No.1 for solitude, but hardly anyone ever hikes it, then who voted for it? 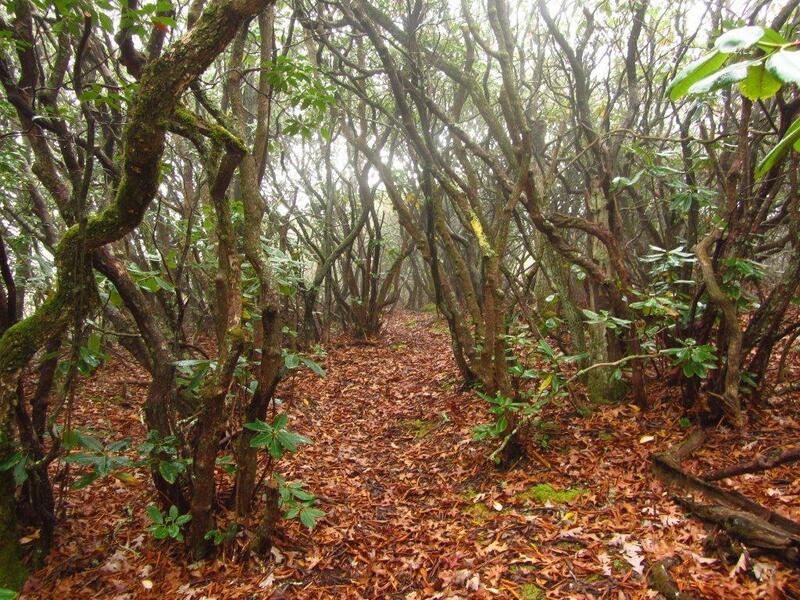 Rhododendron forest on the Bartram Trail. Once you hit the junction with Cheoah Bald (i.e. 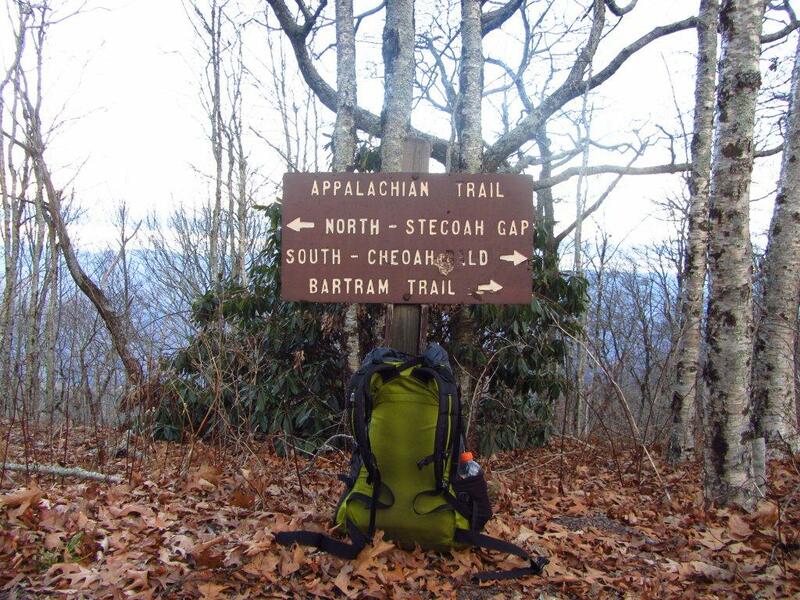 the northern terminus of the BT), take a left and follow the white blazes of the AT through to Davenport Gap. 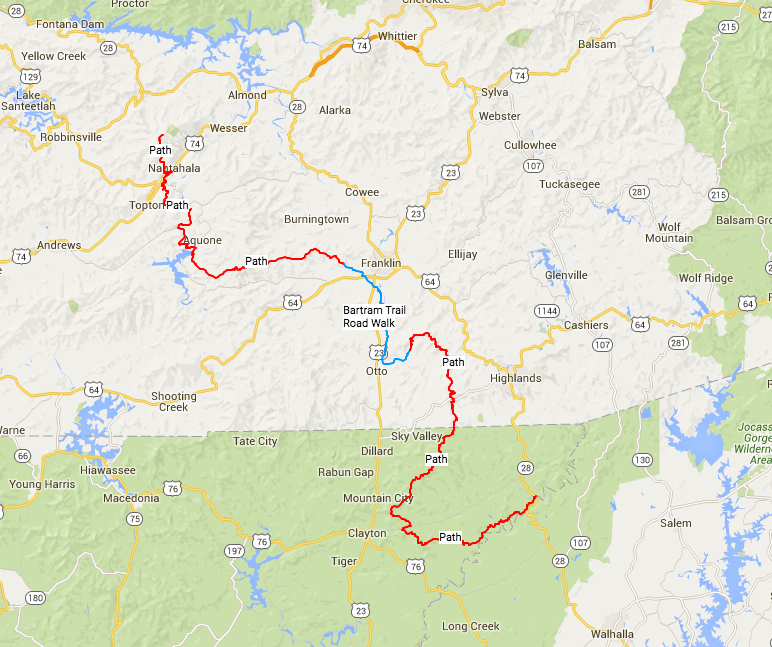 Most of this stretch is through Great Smoky Mountains NP, which is the only section of the SST for which you will require a permit. As of 2013, these are no longer free and need to be booked in advance. Click here for details. In regards to maps and navigation on this extremely well marked trail, I suggest downloading or picking up a copy of the Great Smoky Mountains Trail Map. This excellent overview map shows the SST for the entire stretch from Cheoah Bald to Davenport Gap. Smoky Mountains in November, 2011. 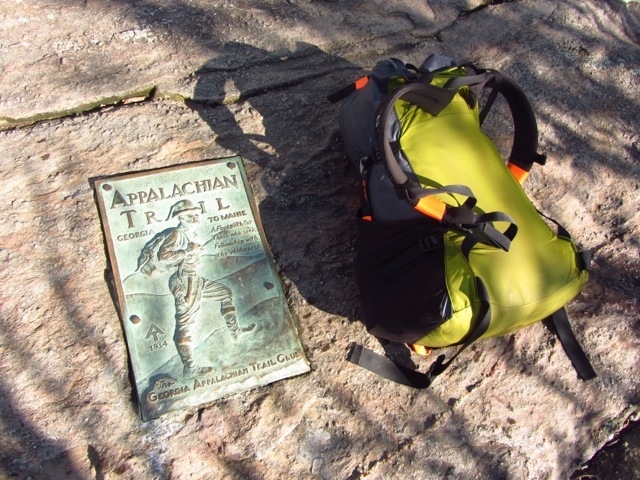 The Benton Mackaye Trail is named after the New England conservationist and visionary, who in 1921 first put forward the idea of the Appalachian Trail. Officially opened on July 16, 2005, during my time on the BMT, I couldn’t help but think that this was what the AT must have been like some 40 or 50 years ago. Same mountains, less people. Indeed, during the entire 299 miles of the BMT, I only met two other section hikers. 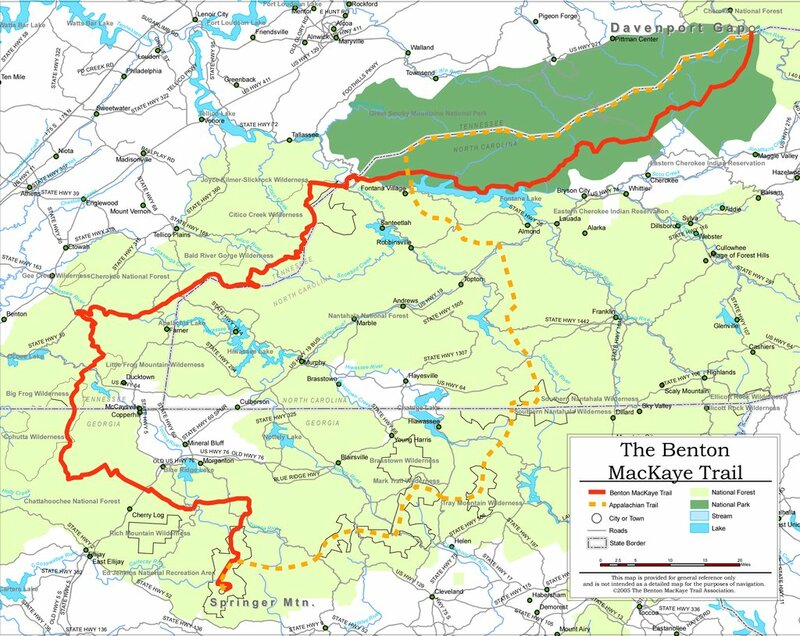 The excellent Benton Mackaye Trail Association website contains up-to-date information on trail conditions, resupply options, shuttles and links to other helpful resources. It also has an online store in which you can purchase maps and guidebooks. 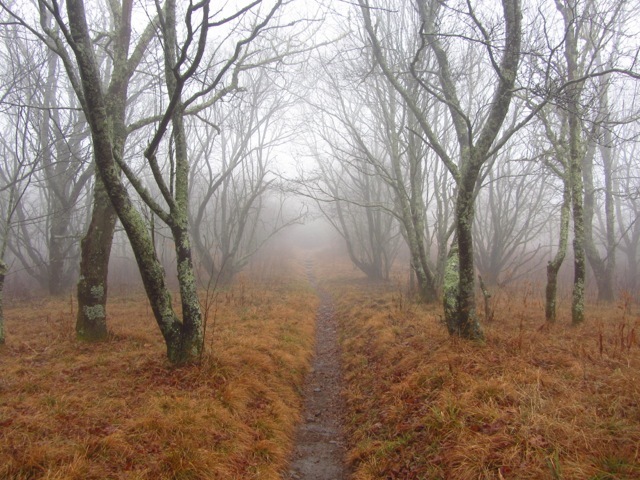 Misty morning on the Benton Mackaye Trail. As of 2016 your primary choices appear to be the Trails Illustrated maps listed on the BMTA Hiker Resources page or the free downloadable USGS 7.5 topographic maps on Caltopo.com. Benton Mackaye Trail Thru-Hiker Guide – Ernest “Sgt. Rock” Engman’s planning guide to the BMT (includes GPS files). Benton Mackaye Trail Guide Books – There are three in total; Georgia, Tennessee / North Carolina & the Smokies. Each are sold separately. BMTA Databook – Distances, water sources, trailhead access, elevations, campsites (Note: A lot of this info is covered in Sgt.Rock’s guide. You don’t need to buy both). Springer Mountain, GA | Southern terminus of the AT, BMT and finishing point of the Southeastern Serpentine Trail. I just want to let you know that the pic you have on the Foothills Trail Section of the SST. That is not Lower Whitewater Falls. That is Upper Whitewater Falls. You hiked past the lower falls but missed it. Its a 1.5 mile spur trail off if the Foothills to get to the viewing deck. You were however within aporox. 300 meters from the top of the falls when you met the Whitewater River at the steel bridge. The Foothills turns right here. Before you cross the bridge. Lower falls is a big and spectacular as the upper falls. Local secret. Most people don’t realize that the lower falls is about 2 or 3 miles downstream of the upper falls. They think the lower cascade of the upper falls is lower Whitewater. They are wrong. Both falls are over 400 feet. If you are ever in the area again. Id love to show you some real local secret locations. Whitewater Falls is 10 miles from my house by the way. Anyway I just wanted to let you know that you missnamed Upper Whitewater Falls. Thanks for taking the time to write. I changed the caption as per your information. So glad I stumbled upon this hike Thank you for posting about it. I Started planning immediately, for an attempt this Fall!